PDF to JPG Converter for Mac is a Mac application that fast converts PDF documents to image files like JPG, PNG, BMP, GIF or TIFF. The program also let users customize the output image DPI (Dots per Inch) to get large high quality images, or small thumbnails. When users want to convert several PDF files in bulk, there is a folder creation function can convert each PDF file to each new folder named as the PDF filename. The DPI option is the biggest difference between this application and other PDF to image converters. Getting high quality images from PDF is easy since this free PDF to image converter works with the DPI option. Users only need to select a high output DPI value like 200 or 400 and the converted images will have the high quality resolution and the large print margin. Also they can change the DPI value to 32 or 64 for thumbnail images. This PDF to image format converter is able to change tons of PDF files to images in batch mode. 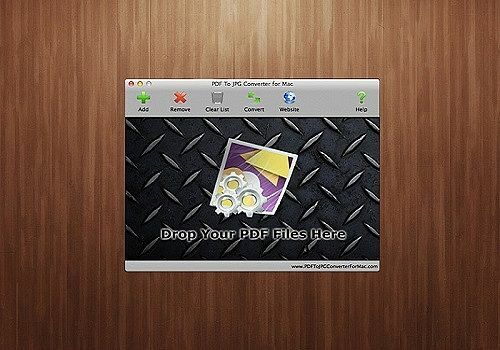 PDF To JPG Converter For Mac developed free converter to convert PDF files in bulk. What's more, PDF To JPG Converter For Mac allows them to convert PDF files in bulk, and has the capability to output images from each PDF file to separated folders. So that users can easily use the exported images and won't confuse with duplicated file names. In addition to convert normal PDF documents to popular image formats, PDF To JPG Converter For Mac also converts restricted PDF files smoothly without asking for the owner password. There is no different between working with normal PDF files and restricted files. Adobe Acrobat Reader pour Mac est un lecteur PDF grâce auquel vous pouvez lire tous les fichiers de ce type sur votre ordinateur. Bien plus qu’un simple lecteur, ce logiciel gratuit est aussi capable de commenter des documents et d’imprimer des PDF, de la manière la plus optimale qui soit. Ce programme vous permet de créer et de modifier complètement des PDF. Un outil de conversion y est également intégré. Un utilitaire efficace sur Mac capable de convertir vos documents PDF dans les formats .txt. .doc et .docx pour les rendre modifiables par un logiciel de traitement de texye. La référence des éditeurs de documents PDF est également disponible sur Mac dans sa version professionnelle.